If you have your own domain name and use it for your email, you can use the email filtering system. You don’t have to host your website or email with Digital Red, though it’s easier if you do. It is intentional that there are no setup notes here because you need an account before you can set anything up, and Daniel will either do the setup for you or tell you what you need to do when creating your account. If you’d like to begin, call or email. Using the email filter costs either £1 per month per email account, or £10 per month per domain. 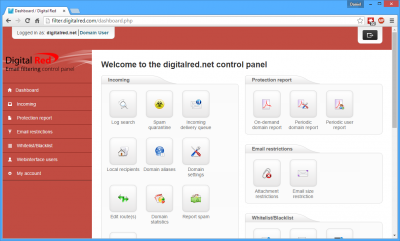 If you host your website or email with Digital Red already we’ll just add the filtering fee to your regular invoice. If you have the domain digitalred.net and have users with addresses like pugh@digitalred.net, pugh2@digitalred.net, barney@digitalred.net, mcgrew@digitalred.net, cuthbert@digitalred.net, dibble@digitalred.net, grub@digitalred.net and so on, you’d pay £1 each upto 10 users and then it’d cost no more for the 11th onwards. There is no minimum or maximum number of addresses. The minimum fee is £1 per month and the maximum is £10 per month – billed annually either way. There are two types of logins for the email filter: you can either log in with your email address, or your domain name. 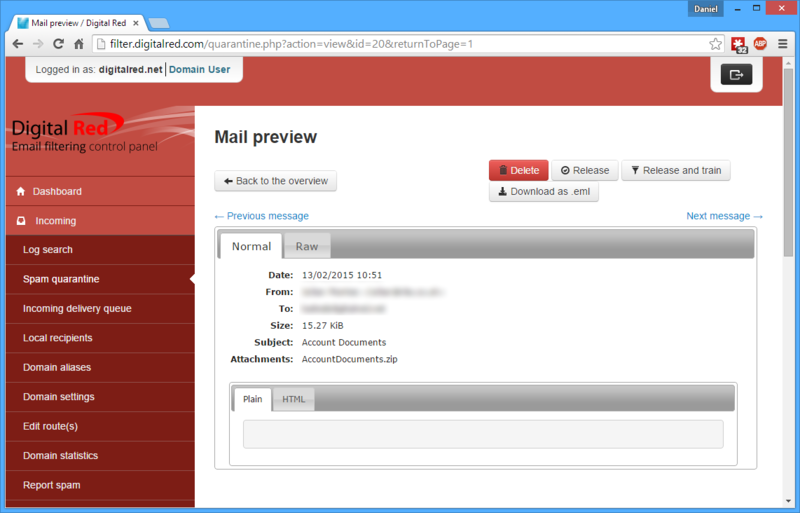 If you log in with your email address (eg name@digitalred.net), you see filtered mail for your address. If you log in with your domain name (eg digitalred.net), you see filtered mail for all the addresses in your domain. When you first began to use the email filter, you’ll have received a password. 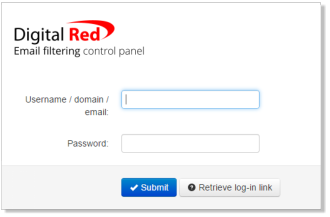 If you’ve lost the password, you can pick a new one – just click the “Retrieve login link” button on the filter.digitalred.com login page. How can I see what kind of mail is getting filtered? You can always see the email that has been filtered. 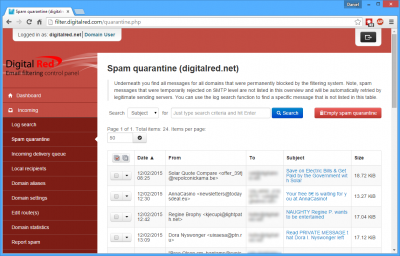 Genuine spam is rejected – it doesn’t make it through the filter. Don’t even worry about that stuff – it’s the real rubbish that comes from known spammers, from servers that send out millions of messages per day, and the malware attacks that pry on thousands of people at a time. The rest of the email is either delivered to your mailbox as normal (so appears in Outlook, on your phone, tablet etc) and the stuff that looks like spam but where the filter isn’t completely sure gets held in “quarantine”. You can check that at any time. 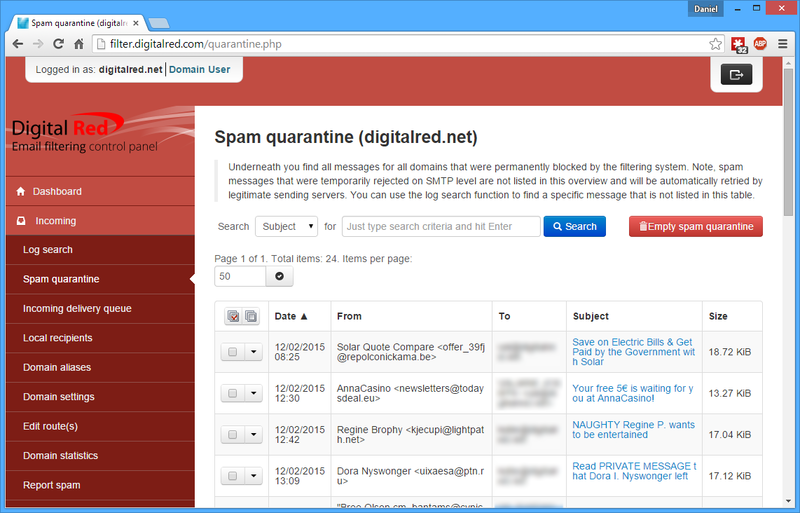 Unless you turn it off, you’ll get an email every morning that shows mail that was quarantined in the last 24hrs, and you can check the quarantine list ‘live’ on the web any time you like by logging in at filter.digitalred.com and click the Spam quarantine button (as shown on the left). What if an email was filtered that shouldn’t have been? To unblock a message which has been filtered when it shouldn’t, you use the Spam Quarantine button from the first page. You can click the Release button at the top right to have the email released from quarantie and delivered to your Inbox as normal, or you can click the Release and train button if you’d like to have that email delivered as normal and to teach the filtering server that you want to get email like that delivered as normal next time. You can download the full documentation for the email filtering system using the links below. There are two lots of instructions, one for the domain administrator login (where you can deal with all the email addresses on your domain) and the other for the email user login (where each user can deal with their own email account).